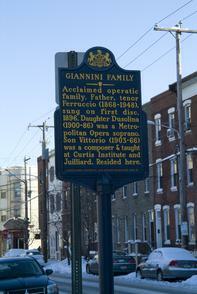 Giannini Family marker & site of Verdi Hall. Reads: "Acclaimed operatic family. Father, tenor Ferruccio (1868-1948) sung on first disc, 1896. Daughter Dusolina (1900-86) was a Metropolitan Opera soprano. Son Vittorio (1903-66) was a composer & taught at Curtis Institute and Julliard. Resided here."